Have you visited another church and thought, “WOW, that’s beautiful. I wonder what our new church will look like?” As we move forward in our building and design process we want to hear from you! It’s time to share your “HOPES & DREAMS” about what our new space will look like. A design team from St. James, led by Danny Baker, is working hard with architects and interior/liturgical design consultants to create and build a space most worthy of God’s Majesty, Glory and Praise. A place where God’s faithful gather to share in joy and in suffering. A place where we lift our voices in sung prayer and give thanks to God for our many blessings. And above all else, a place where we share in the Body and Blood of Christ, remembering His death and resurrection. Click on the link below to take the survey. Your answers will be completely anonymous. This is an exciting time for us here at St. James ̶ we firmly believe with the energy, excitement and hard work already done by our Co-Chairs and Campaign committees, that this campaign can really make our dream of a new church a reality. We realize that there are some that may not see the need for a new church. To really meet the growing needs of our Liberty/Kansas City area, we need a new worship space to be able to minister in the future. Building a new worship space is only a part of a bigger picture. Our ultimate goal is not just building a church to attract and accommodate all who want to be a part of our vibrant community, but also to serve to meet all needs of our parish and Catholic community now and far into the future. We invite you to become an integral part of making this exciting vision a reality. 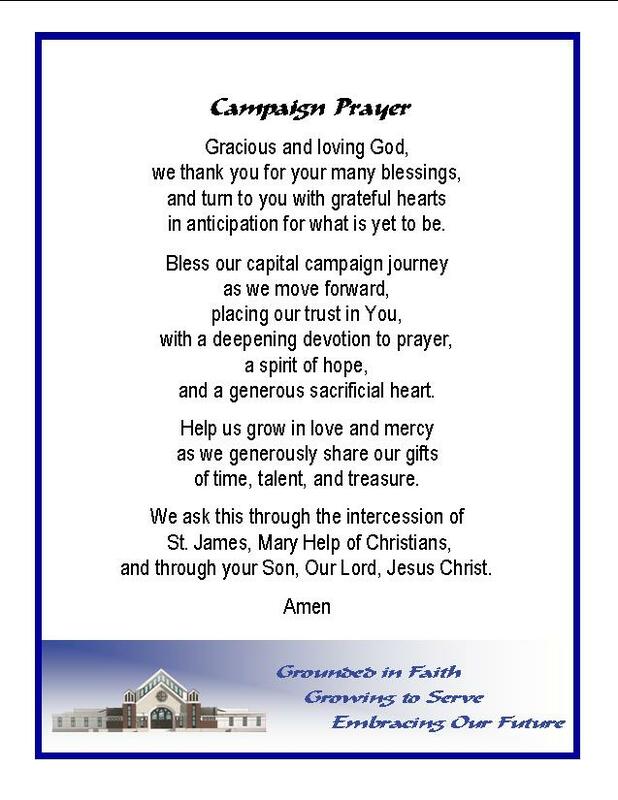 Please, in prayer, consider a generous sacrificial gift to St. James through a pledge to this campaign. 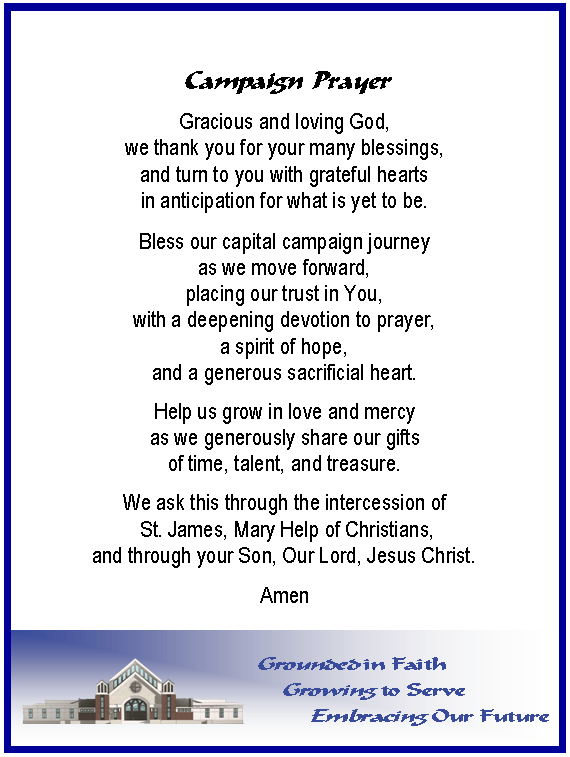 Thank you for all you have done to make St. James Church’s past so rich and blessed, and for your great generosity in helping with our future goals. Together we sacrifice, together we journey, and together we build our faith.